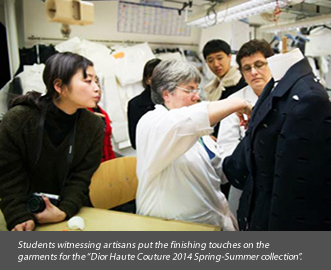 was one of 16 top design schools worldwide to be invited to Christian Dior’s haute couture fashion show in Paris, France. 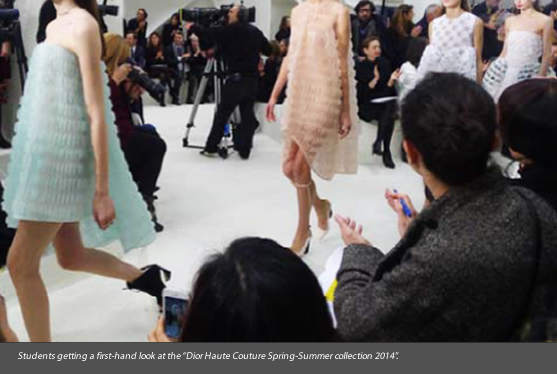 to tour Dior’s headquarters and attend a workshop, conference and haute couture show. Wu Die and Fu Yuji — to fly to Paris with Fashion Design Assistant Programme Director Liz Thng. culture and history by the CEO, Sidney Toledano, and the Archivist, Soizic Pfaff. This trip also gave the Raffles Fashion Designers the rare opportunity to interact with couture designers and other students who share the same passion and talent in fashion design. At the workshop, they met designers from other LVMH houses such as Louis Vuitton and Celine, who shared their experience with the students. The highly anticipated event of the Paris trip was undoubtedly the couture show, which took place at the Musée Rodin. Although the students had a sneak peek of the collection at the workshop earlier, they were still excited to see the completed haute couture, accentuated with exquisite accessories, on the runway. The Raffles Fashion Designers could hardly conceal their undeniable excitement. Fu Yuji expressed his desire to become a top designer in the future. “Of course, I need to study harder to achieve that,” he said. From Dior’s perspective, the point of this grand gesture was to share the passion and savoir‐faire of haute couture to a new generation of would‐be fashion designers. The exclusive invitation by Dior has proven Raffles Shanghai’s standing in the industry. This is another successful milestone of the school’s strong partnership with the industry to groom students into leaders of tomorrow. 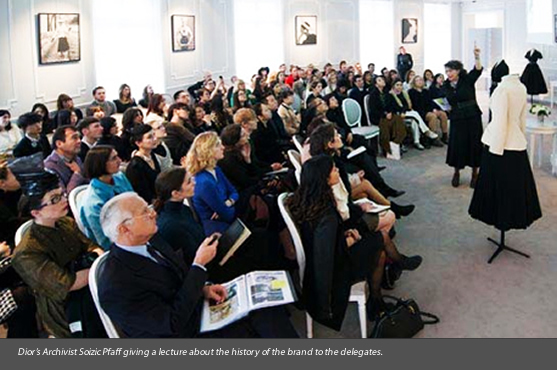 Raffles Shanghai will continue to excel and strive to nurture more new design talents for China’s fashion industry.